It’s been a while since I’ve done a review on my blog. My favorite things to review are high end make-up products. How are the colors? What’s the texture like? Are they really worth the price? Those questions are the kind I like to see answered. 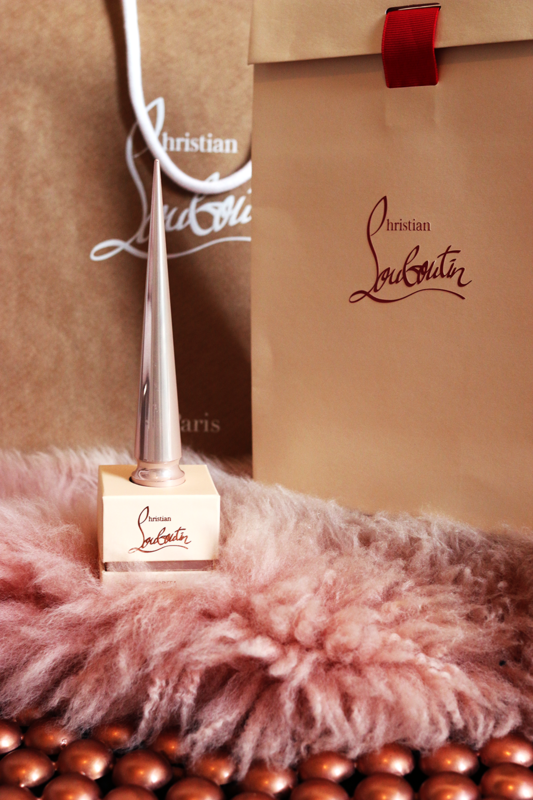 So today I’m going to review the Christian Louboutin La Favorita Nail Polish. I got it from my mom a while ago as a gift (thanks mom! <3). It’s probably one of the most expensive nail polishes out there, so if you’re curious if it’s just the price for the packaging you’re paying or if it’s actually a great nail polish, keep reading! Well, if this isn’t the prettiest nail polish packaging you’ve ever seen, I don’t know what is. 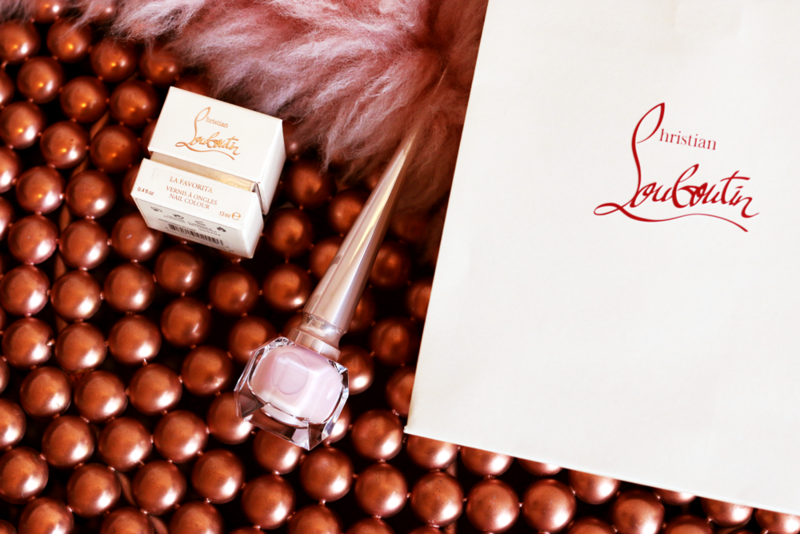 You can definitely see that this nail polish is designed by a fashion designer, because Christian Louboutin truly out did himself and created something completely different and unique. The lid reminds me of the famous killer heels from Louboutin. It looks really good in my interior design to be honest! This nail polish is part of the ‘The Nudes’ Collection, so that’s why the lid of the nail polish is in this pretty pearl colored finish. Surprisingly, the lid is very nice to hold in your hands and gives you a bit of extra weight and control when painting your nails. It has a regular, thin brush, which makes very precise application possible. 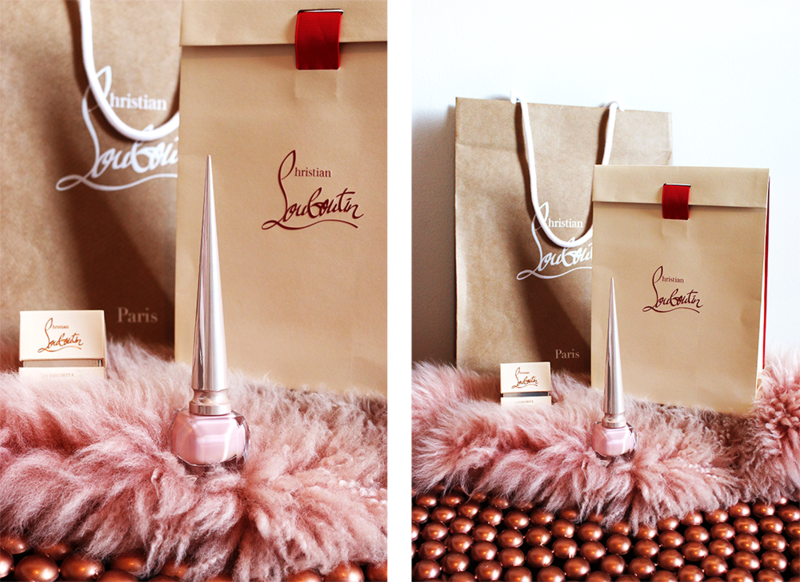 Yup, I’m loving the packaging (and the bags the polish comes in too)! 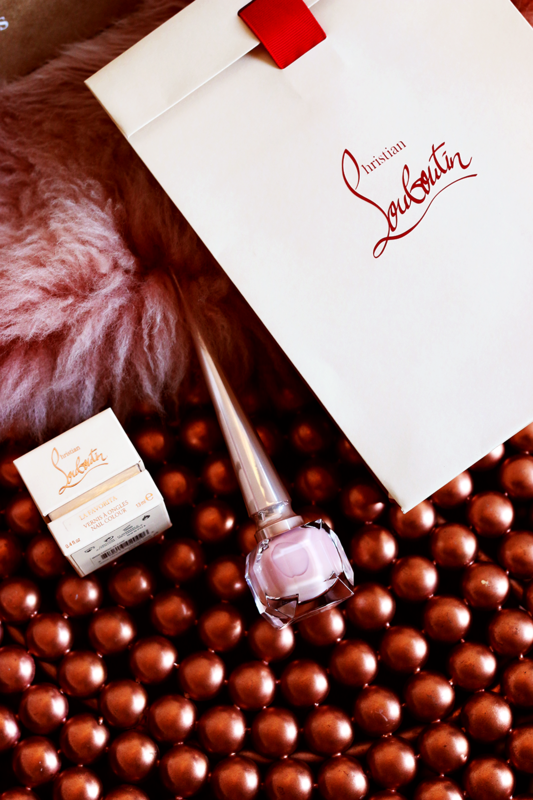 Christian Louboutin describes this The Nudes La Favorita color as a sheer blush pink. Well guys, this nail polish isn’t sheer at all. Personally, I never found the perfect creamy light pink nail polish. They usually needed 4 coats or something, ain’t nobody got time for that! This nail polish is a game changer for me. This is the first light pink polish I found that’s opaque in 2 coats. I would recommend 3 coats if you really want to see no nail at all, but trust me, 2 coats were fine too. I’m really impressed – most high end nail polishes are overpriced due to the packaging and aren’t that great quality at all. Christian Louboutin proves that this can be untrue too! This nail polish is a yay for me, but I can understand that not everybody would agree with me. The quality of this nail polish is suprisingly good, the packaging is stunning, but the price tag is out of this world. This polish costs $50 and you can find it at Sephora. This nail polish was a gift from my mom – otherwise I would never spend so much money on a nail polish. I do have to say, if you’re also really struggle with finding a perfect light pink nail polish and you’re a sucker for packaging, I think $50 is worth it. It’s not like you’re paying for a bad product if you know what I mean. Anyways, I would love to know if you would pay so much money for one polish and what your favorite nail polish brand is! Let me know in the comments below! WHAT’S YOUR FAVORITE NAIL POLISH BRAND? Heel mooi! Ik ben erg fan van dit soort tinten! Wat een super toffe verpakking! Ik zou alleen nooit zo veel geld uitgeven aan 1 nagellakje..
Wow echt een prachtige nagellak! Deze staat nog steeds heel erg hoog op mijn verlanglijstje, zo ontzettend luxe! Kan echt genieten van dit soort bijzondere items. En weer geweldige foto’s! Het flesje ziet er schitterend uit zeg en mooie foto’s ook! Alleen al om de prachtige kleur en het flesje zou ik deze lak zeker kopen! Waauw mooie foto’s! Prachtige flesje en mooie kleur <3 Love it! Het ja echt een beauty, zo’n onwijs mooi cadeau! Ziet er prachtig uit hoor! Ik vind alleen de dop een beetje gevaarlijk hahaha! I love the packaging of the nail polish. It is definitely fancy! Soooo jelly of this one!